Keep them disease-free until they have 2 sets of leaves. Tomato seeds simply need light, soil, moisture, and protection from disease in order to germinate. A good mix helps make those things possible. Your best choice when growing tomatoes from seeds: sterile potting mix. You can purchase a commercially-prepared sterile seed starting mix or make your own. Commercially-prepared starting mixes vary in composition. Make sure you select a potting mix (or seed starting mix), not potting soil (which is heavier). Choose a mix that is lightweight, holds water, and is light on fertilizer. You don’t want your tomato seedlings to get too overfed while they still can get nutrients from the seed. Pick a recipe and combine ingredients in a large sterile tray, pot, or bucket. Why Not Use Garden Soil? 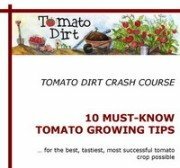 Can I use soil from my garden to start my tomato seeds? I think it might save me some money. Garden soil is not sterile. Try to avoid using it if possible because it’s full of weed seeds, it compacts (preventing good circulation), and worst of all – it contains nasty disease-carrying organisms, bacteria, and fungi, which have a bad reputation for causing damping-off disease. 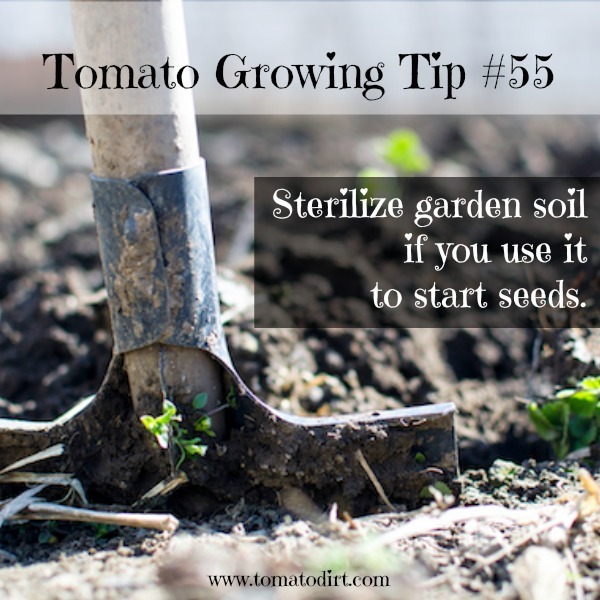 If you must use garden soil, sterilize it before planting. Place soil in a shallow pan. Bake at 180°F for 45 minutes. Make sure soil reaches 180°F so all the nasties are zapped. But don’t overcook, or you’ll release toxins in the soil. Whichever potting mix you use, make sure you moisten it well. Add warm water and stir with a sterile trowel or large wooden spoon until the mixture is evenly damp, like a wrung-out sponge. Press it lightly into your seed starting containers. Keep extra sphagnum peat moss on hand when growing tomatoes from seeds and sprinkle it on top of your prepared seed cell trays. Its anti-fungal properties are helpful in keeping seeds and seedlings disease-free. Starting tomato seeds-is it really that hard? When should you start tomato seeds in your area? Should I grow heirloom tomatoes or hybrids?